ARCHANGELS is a company based in God's Country (beautiful sunny Southern California), dealing in Rare and Unique Paper Collectibles. We specialize in vintage Comic Books, Original Comic Book Artwork, Hollywood Movie Posters and other related items as well. We are Senior Advisors to the Overstreet Comic Book Price Guide and a Charter Member Dealer with the Comics Guaranty, LLC (CGC). For other wonderful items, make sure to visit us at our About Me Page. Incredible Hulk #222 Original Art by Jim Starlin. Superb 4-panel battle page for the Incredible Hulk #222 page 26 by fan favorite Jim Starlin (pencils) and the talented Alfredo Alcala (inks). 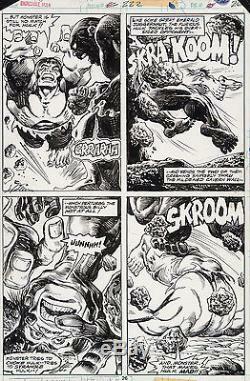 This page features the climatic scene as the Hulk engages the cave dwelling cannibalistic monster named Billy, in a no-holds-barred fight to-the-death. Full fledged action battle pages such as this are quite scarce and in high demand among seasoned collectors. A stunning example of the Hulk doing what he does best, beat the bad guys to a pulp. Excellent condition with image measuring 10" x 15". The item "Incredible Hulk #222 Original Art by Jim Starlin 4 panel Battle Page" is in sale since Thursday, December 04, 2014. This item is in the category "Collectibles\Comics\Original Comic Art\Interior Pages". The seller is "water-walker" and is located in San Diego, California. This item can be shipped to North, South, or Latin America, all countries in Europe, Japan, Australia.